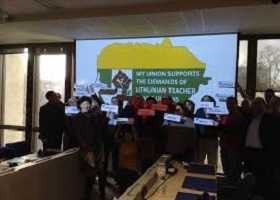 Teachers in Lithuania vow to continue their ongoing protests over the new tenure-based pay system introduced in September, the trade union behind the industrial action said LETA/BNS. "Over 100 schools will be on strike next week," Andrius Navickas, leader of the Lithuanian Education Employees Trade Union, told journalists during a convention of striking teachers in Vilnius. "Obviously, we were very much saddened by the minister's speech as the minister continues to speak but cannot hear." Over 70 schools are now taking part in the industrial action in Lithuania, with teachers saying that the new system is non-transparent and unfair and that the ministry failed to ensure proper implementation of this overhaul. They also say that teachers across Lithuania are paid differently for the same job due to subjective interpretations of the new rules. The trade union also demands cuts to the number children in classes and raising pay coefficients for teachers by a fifth. The ministry, however, says the new system has allowed raising teachers' wages and better balancing their workload.